In Normandy, France, on top of solid rock in the middle of the bay, you'll see a town called Mont Saint-Michel with a magnificent and beautiful monastery. 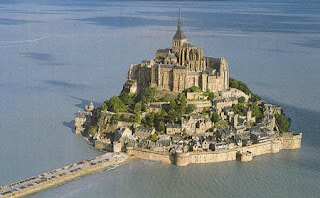 At first the Mont Saint-Michel are only accessible when the water was receding around the city. 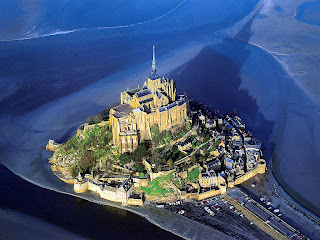 Mont Saint-Michel become one of France tourist attractions you must visit. Mont Saint-Michel previously connected to the mainland via a thin natural land bridge, which before modernization covered at high tide and low tide looking at. This connection has been compromised by several developments. Mont Saint-Michel is now accessible 24 hours. In the city that stands on an amazing geological formations, you can take a tour of the monastery and surrounding towns during the day. Even better, you spend the night in one of the inn for a different experience as the day went dark. At the entrance of this medieval town, you will find an ancient burgher guard room which now serves as the Office of Tourism. Once through the gate Boulevard, you will then see the gates of the King, from here you will find the Grande Rue or the main road to museums, shops and houses from the 15th century and 16. In the city there is also a parish church dedicated to St. Pierre, the patron saint of fishermen. This is a small building from the 15th century and 16. After passing it, you will arrive at Grande Grande majesty degre or stairs that are beginning to Marvel. After that you can admire the Abbey church and the castle down the road when you can enjoy the beautiful scenery and unrivaled of the bay. The monastery here was originally built with the scheme of the Holy Sepulchre in Jerusalem, after the second abbot of St Michael's vision into account. Mont Saint-Michel is also interesting for you to explore the mythology of Arthur, as claimed by Thomas Malory that this is the place where King Arthur fought a giant devouring itself facing a virgin, before setting off on a campaign against the emperor of Rome.